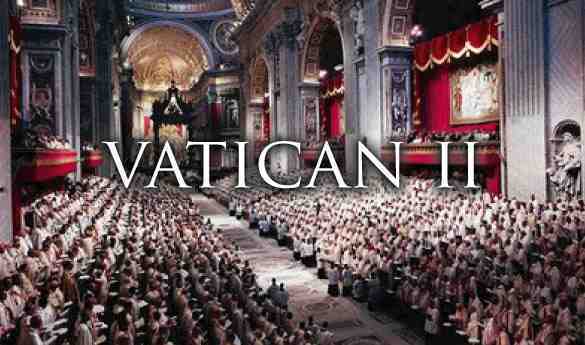 Second Vatican Council – 50 Years Later What Does It Say To Us? Northern Catholic Conference, Liverpool 2013. Northern Catholic Conference , June 8th, 2013 – Vatican Two – Reading the signs of the times: 50 Years Later What Does The Council Say To Us? Before turning to the main body of my remarks it is worth saying how pleased I am that your conference is taking place here in this chapel at Liverpool Hope University. It was where I worshipped while I was a student living in Newman Hall, in what was then Christ College, and it was where I was married twenty five years ago next month. 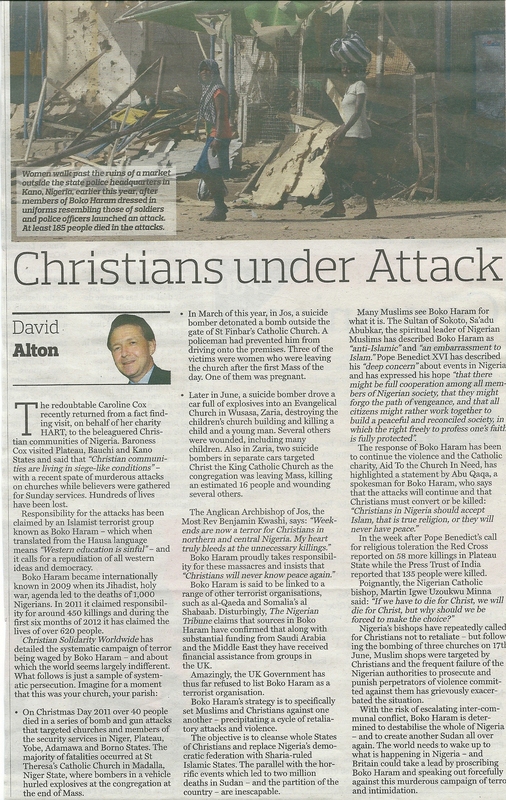 Perhaps it is also worth recording two things from recent reports: first, that an estimated 100,000 people die for their Christian faith each year and, second, that at a time when it is fashionable to attack the Church for its failings, we might just reflect for a moment on the extraordinary outpouring of good for which the Church is responsible: without any distinction of religion or race. Worldwide, the Church runs 70,544 kindergartens with 6,478,627 pupils; 92,847 primary schools with 31,151,170 pupils; 43,591 secondary schools with 17,793,559 pupils. She educates 2,304,171 high school pupils, and 3,338,455 university students. The Church’s worldwide charity and healthcare centres include: 5,305 hospitals; 18,179 dispensaries; 547 Care Homes for people with Leprosy; 17,223 Homes for the elderly, or the chronically ill or people with a disability; 9,882 orphanages; 11,379 crèches; 15,327 marriage counseling; 34,331 social rehabilitation centres and 9,391 other kinds of charitable institutions. In addition, consider its work in establishing hospices for the terminally ill and dying, it shelters for the homeless, and its work in refugee camps, among internally displaced people and with the poor. That we fail, both personally and institutionally, is self evident – and it was ever thus – but occasionally we should recall the lives that have been laid down for the religious freedoms we enjoy today and the lives which continued to be given in sacrifice or service. If a faith is worth dying for it is worth living for – and these examples of sacrifice and self giving should inspire and animate us all. That call to give generously of ourselves – and to share our belief and love of God and the man made in his image – was at the heart of the teaching of the Second Vatican Council. 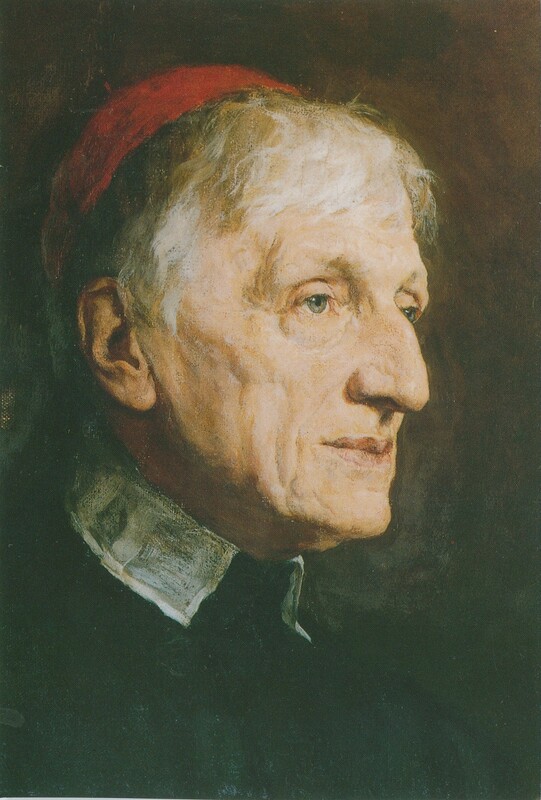 Many have remarked that the missing Cardinal at the Council was Blessed John Henry Newman because many of the ideas which it proclaimed were ideas which he had put forward a century before. Newman understood better than anyone that this new birth would not be without pain. Over 160 years later, men and women are still struggling with the same questions and making the same journey. That vast numbers of our countrymen still search for deeper spiritual meaning to their lives undoubtedly puzzles the author of “The God Delusion” and his fellow protestors. They find it even more puzzling that Christians are willing to surrender something of their freedom – “freedom to choose” – for something of greater worth. Perhaps that will speak into the hearts of those demonstrating here today for their right to choose to take the lives of the unborn children. Newman’s belief in the truth of the Christian creeds, his belief in the teaching authority of the Pope, and his desire that each person should embrace their duty to share their beliefs and to act on them in a way that would benefit society as a whole, should be central to our understanding of the theology of the Second Vatican Council – Newman’s Council – and to Pope Benedict’s decision to beatify him and to come to Birmingham to do it. 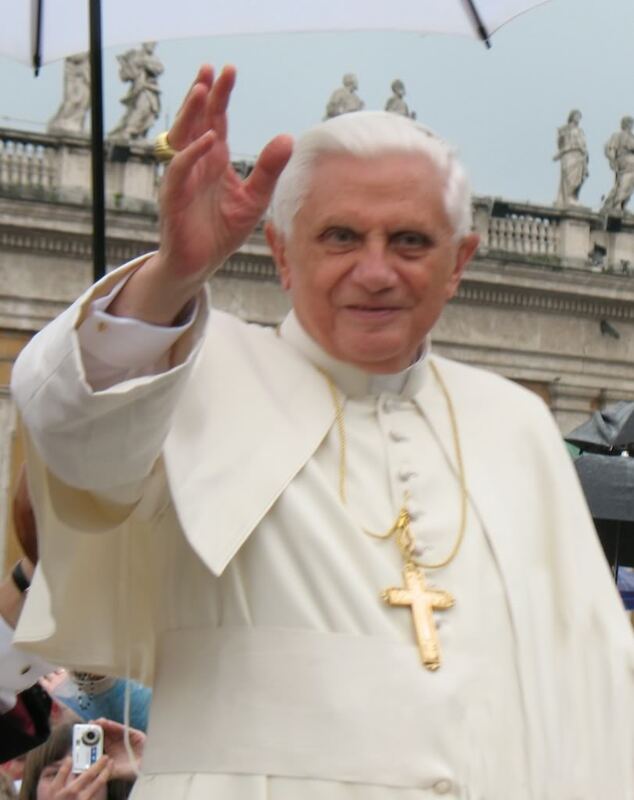 Pope Benedict Emeritus designated the year of faith as a time to mark and reflect on two things – the 50th anniversary of the Second Vatican Council and the 20th anniversary of the Catechism of the Catholic Church. I wonder how many of us – either as individuals or parishes have actually done this yet? Despite the many negatives events of the intervening 50 years it was the Council which gave us Pope John Paul II and Pope Benedict XVI – both of whom upheld the spirit and teachings of the Council – and in Pope Francis I we have the natural successor of Pope John XXIII. For every Catholic bewildered or upset by change there were many more who knew that the Church had to speak the old truths in a new way and that inertia was not an option. Among its s many documents the Council issued four Constitutions. One of them, Lumen Gentium, the dogmatic constitution of the Church, defined the role of Pontiff as integrating the pope’s power of primacy with the power of the college of bishops – an issue to which Pope Francis may well return, especially in the light of his decision to repeatedly use the title of Bishop of Rome rather than that of Pope when describing himself. If he decided to develop such thinking on the decentralisation of decision making away from the Roman Curia, it might, who knows, well open the way to the convening of a Third Vatican Council. In addition to looking at the internal organisation of the Church and its ability to fulfil its mission in the world, another of the great themes and goals of the Second Vatican Council was the importance of developing inter denominational and inter faith relationships and promoting religious freedom for all. This was a theme which Pope Francis emphasised during a meeting with religious leaders of other faiths in which he pledged friendship, respect and continued dialogue with other religious leaders, promising cooperation with Orthodox churches, describing the spiritual bond between Catholics and Jews as “very special” and expressing gratitude to Muslim leaders. “The Catholic Church is aware of the importance of the promotion of friendship and respect between men and women of different religious traditions,” the Pope said. “I want to repeat this: The promotion of friendship and respect between men and women of different religious traditions.” Among those present were Bartholomew I, the spiritual leader of Orthodox Christians, as well as other Orthodox leaders; representatives from different Protestant denominations; Jewish and Muslim leaders and advocates; and representatives of the Buddhist, Sikh, Hindu and Jainist faiths. Soon after his election as pope, Francis sent a message to Riccardo Di Segni, the chief rabbi of Rome, pledging a spirit of “renewed collaboration.” Rabbi Di Segni attended the Vatican meeting and praised the new pope’s outreach. Imam Yahya Pallavicini, vice president of the Italian Islamic Religious Community, shook hands with Pope Francis and presented him with a book exploring the contemplative dimensions of Islam. He said he was touched when Francis expressed his gratitude for the presence of Muslim leaders in the room, and he predicted that the new pope would deepen the relationship between Catholics and Muslims. 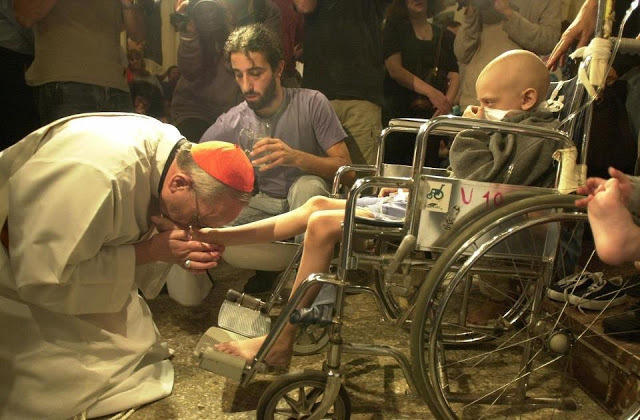 All of us saw the symbolism and the power of love in the Pope’s decision to wash the feet of a Muslim woman during the Easter liturgies. John XXIII’s convening of the Council was a time of great hope for the Church but this was not mirrored in the secular world, where it was a tense time – defined by the Cuban Missile Crisis and the stand-off between Presidents J.F.Kennedy and Nikita Kruschev. The crisis was at its height and the US was carrying out nuclear tests at Johnston Island and in Nevada. The simmering Cold War conflict was being fought out in the open in proxy wars, civil wars, and revolutions, aided and abetted by the super powers. In other stirrings which underlined the sense of change afoot everywhere, Dr.Martin Luther King had been arrested for his campaign for civil rights and a little known anti-apartheid leader, Nelson Mandela, had been thrown in jail in South Africa. Countries like Rwanda and Burundi had become independent and others, like Algeria, had voted to do the same. In 1945, 750 million people were governed by colonial powers but by 1962 two thirds of the countries in the United Nations were independent nations newly independent. Religious and political change was also affecting the arts, music and culture. In its vanguard, the Beatles were taking their distinctive Liverpool beat into recording studios and their manager, Brian Epstein, was tying up recording contracts. All these things were having a profound effect on my generation and at my new school, where I had just started as a first former, each morning we were asked to pray for a resolution of the dangerous confrontation between the USA and USSR and also to pray for the success of the Council. As the Council fathers gathered in October 1962, for the twenty-first Ecumenical Council of the Church, they came with a mandate to address the relationship between the Catholic Church and the modern world. Good Pope John had signalled his intention to convene the Council just three months after his election as Pontiff in October 1958. Pope John passionately believed that Christians needed to stand together and show love and respect towards one another. He invited, and they accepted, representatives of the Protestant and Orthodox churches to attend the Council as observers. He noted his intention to re-read St. Augustine’s City of God, and, having done so, he determined to bring the Church to an understanding of its contemporary prophetic role. He wanted his brother bishops and the laity to see that in every generation they must discern the signs of the times, put them into the context of the deeper patterns of history, and annunciate the still deeper principles of order (Book XIX of St. Augustine’s City of God: “peace is the tranquillity of order”) which must combat the maladies of the age. In stating that there was “a basis for optimism” he contrasted the freedom in which the Second Vatican Council was meeting with earlier times whilst not neglecting to mention those bishops who were missing from the Council’s deliberations: “They suffer imprisonment and every kind of disability because of their faith in Christ.” That remains the case for many bishops, priests, religious and lay people today. Today, Venerable Brethren is a day of joy for Mother Church: through God’s most kindly providence the longed-for day has dawned for the solemn opening of the Second Vatican Ecumenical Council, here at Saint Peter’s shrine. And Mary, God’s Virgin Mother, on this feast day of her noble motherhood, gives it her gracious protection…. A positive proof of the Catholic Church’s vitality is furnished by every single council held in the long course of the centuries—by the twenty ecumenical councils as well as by the many thousands of memorable regional and provincial ones emblazoned on the scroll of history. We address you, therefore, as Christ’s vicar, and We naturally begin this General Council by setting it in its historical context. The voice of the past is both spirited and heartening. We remember with joy those early popes and their more recent successors to whom we owe so much. Their hallowed, momentous words come down to us through the councils held in both the East and the West, from the fourth century to the Middle Ages, and right down to modern times. Their uninterrupted witness, so zealously given, proclaims the triumph of Christ’s Church, that divine and human society which derives from its divine Redeemer its title, its gifts of grace, its whole dynamic force. Certain it is that the critical issues, the thorny problems that wait upon men’s solution, have remained the same for almost twenty centuries. And why? Because the whole of history and of life hinges on the person of Jesus Christ. Either men anchor themselves on Him and His Church, and thus enjoy the blessings of light and joy, right order and peace; or they live their lives apart from Him; many positively oppose Him, and deliberately exclude themselves from the Church. The result can only be confusion in their lives, bitterness in their relations with one another, and the savage threat of war. As regards the immediate cause for this great event, which gathers you here together at Our bidding, it is sufficient for Us to put on record once more something which, though trifling in itself, made a deep impression on Us personally. The decision to hold an ecumenical council came to Us in the first instance in a sudden flash of inspiration. We communicated this decision, without elaboration, to the Sacred College of Cardinals on that memorable January 25, 1959, the feast of Saint Paul’s Conversion, in his patriarchal basilica in the Ostien Way. 4 The response was immediate. It was as though some ray of supernatural light had entered the minds of all present: it was reflected in their faces; it shone from their eyes. At once the world was swept by a wave of enthusiasm, and men everywhere began to wait eagerly for the celebration of this Council. In the daily exercise of Our pastoral office, it sometimes happens that We hear certain opinions which disturb Us—opinions expressed by people who, though fired with a commendable zeal for religion, are lacking in sufficient prudence and judegment in their evaluation of events. 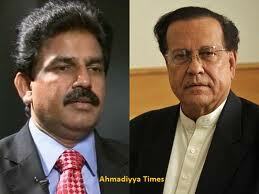 They can see nothing but calamity and disaster in the present state of the world. They say over and over that this modern age of ours, in comparison with past ages, is definitely deteriorating. One would think from their attitude that history, that great teacher of life, had taught them nothing. They seem to imagine that in the days of the earlier councils everything was as it should be so far as doctrine and morality and the Church’s rightful liberty were concerned. Present indications are that the human family is on the threshold of a new era. We must recognize here the hand of God, who, as the years roll by, is ever directing men’s efforts, whether they realize it or not, towards the fulfilment of the inscrutable designs of His providence, wisely arranging everything, even adverse human fortune, for the Church’s good. As a simple example of what We mean, consider the extremely critical problems which exist today in the political and economic spheres. Men are so worried by these things that they give scant thought to those religious concerns, which are the province of the Church’s teaching authority. All this is evil, and we are right to condemn it. But this new state of affairs has at least one undeniable advantage: it has eliminated the innumerable obstacles erected by worldly men to impede the Church’s freedom of action. We have only to take a cursory glance through the annals of the Church to realize that even those ecumenical councils which are recorded there in letters of gold, were celebrated in the midst of serious difficulties and most distressing circumstances, through the unwarranted intervention of the civil authority. Such intervention was sometimes dictated by a sincere intention on the part of the secular princes to protect the Church’s interests, but more often than not their motives were purely political and selfish, and the resultant situation was fraught with spiritual disadvantage and danger. It demonstrates how we must conduct this mortal life of ours. If we are to achieve God’s purpose in our regard we have a twofold obligation: as citizens of earth, and as citizens of heaven. That is to say, all men without exception, both individually and in society, have a life-long obligation to strive after heavenly values through the right use of the things of this earth. These temporal goods must be used in such a way as not to jeopardize eternal happiness. True enough, Christ our Lord said: “Seek first the kingdom of God and His justice,” 5 and this word “first” indicates what the primary direction of all our thoughts and energies must be. Nevertheless, we must not forget the rest of Our Lord’s injunction: “and all these things shall be given you besides.” 6 Thus the traditional as well as the contemporary Christian approach to life is to strive with all zeal for evangelical perfection, and at the same time to contribute toward the material good of humanity. It is from the living example and the charitable enterprise of such Christians as these that all that is highest and noblest in human society takes its strength and growth. The Church has never been stinting in her admiration for the results of man’s inventive genius and scientific progress, which have so revolutionized modern living. But neither has she been backward in assessing these new developments at their true value. While keeping a watchful eye on these things, she has constantly exhorted men to look beyond such visible phenomena—to God, the source of all wisdom and beauty. Her constant fear has been that man, who was commanded to “subject the earth and rule it,” 7 should in the process forget that other serious command: “The Lord thy God shalt thou worship, and Him only shalt thou serve.” 8 Real progress must not be impeded by a passing infatuation for transient things. There was no need to call a council merely to hold discussions of that nature. What is needed at the present time is a new enthusiasm, a new joy and serenity of mind in the unreserved acceptance by all of the entire Christian faith, without forfeiting that accuracy and precision in its presentation which characterized the proceedings of the Council of Trent and the First Vatican Council. What is needed, and what everyone imbued with a truly Christian, Catholic and apostolic spirit craves today, is that this doctrine shall be more widely known, more deeply understood, and more penetrating in its effects on men’s moral lives. What is needed is that this certain and immutable doctrine, to which the faithful owe obedience, be studied afresh and reformulated in contemporary terms. For this deposit of faith, or truths which are contained in our time-honoured teaching is one thing; the manner in which these truths are set forth (with their meaning preserved intact) is something else. This, then, is what will require our careful, and perhaps too our patient, consideration. We must work out ways and means of expounding these truths in a manner more consistent with a predominantly pastoral view of the Church’s teaching office. In these days, which mark the beginning of this Second Vatican Council, it is more obvious than ever before that the Lord’s truth is indeed eternal. Human ideologies change. Successive generations give rise to varying errors, and these often vanish as quickly as they came, like mist before the sun. The Church has always opposed these errors, and often condemned them with the utmost severity. Today, however, Christ’s Bride prefers the balm of mercy to the arm of severity. She believes that, present needs are best served by explaining more fully the purport of her doctrines, rather than by publishing condemnations. The great desire, therefore, of the Catholic Church in raising aloft at this Council the torch of truth, is to show herself to the world as the loving mother of all mankind; gentle, patient, and full of tenderness and sympathy for her separated children. To the human race oppressed by so many difficulties, she says what Peter once said to the poor man who begged an alms: “Silver and gold I have none; but what I have, that I give thee. In the name of Jesus Christ of Nazareth, arise and walk.” 9 In other words it is not corruptible wealth, nor the promise of earthly happiness, that the Church offers the world today, but the gifts of divine grace which, since they raise men up to the dignity of being sons of God, are powerful assistance and support for the living of a more fully human life. She unseals the fountains of her life-giving doctrine, so that men, illumined by the light of Christ, will understand their true nature and dignity and purpose. Everywhere, through her children, she extends the frontiers of Christian love, the most powerful means of eradicating the seeds of discord, the most effective means of promoting concord, peace with justice, and universal brotherhood. Unhappily, however, the entire Christian family has not as yet fully and perfectly attained to this visible unity in the truth. But the Catholic Church considers it her duty to work actively for the fulfilment of that great mystery of unity for which Christ prayed so earnestly to His heavenly Father on the eve of His great sacrifice. The knowledge that she is so intimately associated with that prayer is for her an occasion of ineffable peace and joy. And why should she not rejoice sincerely when she sees Christ’s prayer extending its salvific and ever increasing efficacy even over those who are not of her fold? Thus, venerable brethren in the episcopate, “our heart is wide open to you.” 13 Here we are assembled in this Vatican Basilica at a turning-point in the history of the Church; here at this meeting-place of earth and heaven, by Saint Peter’s tomb and the tomb of so many of Our predecessors, whose ashes in this solemn hour seem to thrill in mystic exultation. For with the opening of this Council a new day is dawning on the Church, bathing her in radiant splendour. It is yet the dawn, but the sun in its rising has already set our hearts aglow. All around is the fragrance of holiness and joy. Yet there are stars to be seen in this temple, enhancing its magnificence with their brightness. You are those stars, as witness the Apostle John; 14 the churches you represent are golden candlesticks shining round the tomb of the Prince of Apostles. 15 With you We see other dignitaries come to Rome from the five continents to represent their various nations. Their attitude is one of respect and warm-hearted expectation. Hence, it is true to say that the citizens of earth and heaven are united in the celebration of this Council. The role of the saints in heaven is to supervise our labours; the role of the faithful on earth, to offer concerted prayer to God; your role, to show prompt obedience to the supernatural guidance of the Holy Spirit and to do your utmost to answer the needs and expectations of every nation on earth. To do this you will need serenity of mind, a spirit of brotherly concord, moderation in your proposals, dignity in discussion, and wisdom in deliberation. God grant that your zeal and your labours may abundantly fulfil these aspirations. The eyes of the world are upon you; and all its hopes. Mary, help of Christians, help of bishops; recently in your church at Loreto, where We venerated the mystery of the Incarnation, 16 you gave us a special token of your love. Prosper now this work of ours, and by your kindly aid bring it to a happy, successful conclusion. And do you, with Saint Joseph your spouse, the holy apostles Peter and Paul, Saint John the Baptist and Saint John the Evangelist, intercede for us before the throne of God. 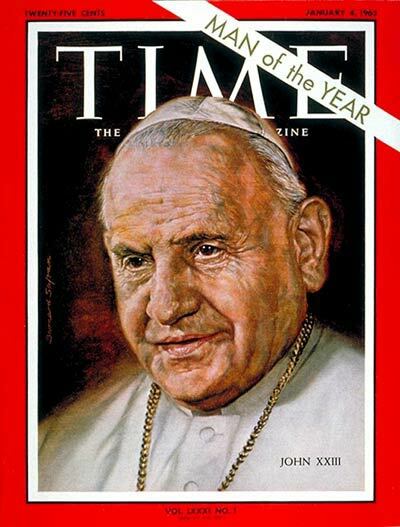 Of course, Pope John XXIII would be dead the following year, 1963, and it would be left to Paul VI to see though the work of the Council which would end on December 8th 1965. The Council which was attended by over 2,000 bishops and advisors and observers from over 17 different Christian denominations. I can’t speak about all or many of these but let me refer to Lumen Gentium which not only states that lay people have a right to speak out when they believe that it would assist the Church in its apostolic work but they have a duty to do so and let me also single out another document which I think set the tone for the work of the Council along with the declaration on religious liberty. On April 11th, 2013, we will celebrate the official publication of Pope John XXIII’s encyclical, Pacem in Terris: On Establishing Peace in Truth, Justice, Charity and Liberty. It’s a refrain we need again in these days: a recollection of what went before, the price that was paid, a reminder of how importance it is to cherish our story, to know who we are, not to lose our identity, and in every generation to understand and not to fear the need for renewal and sacrifice. 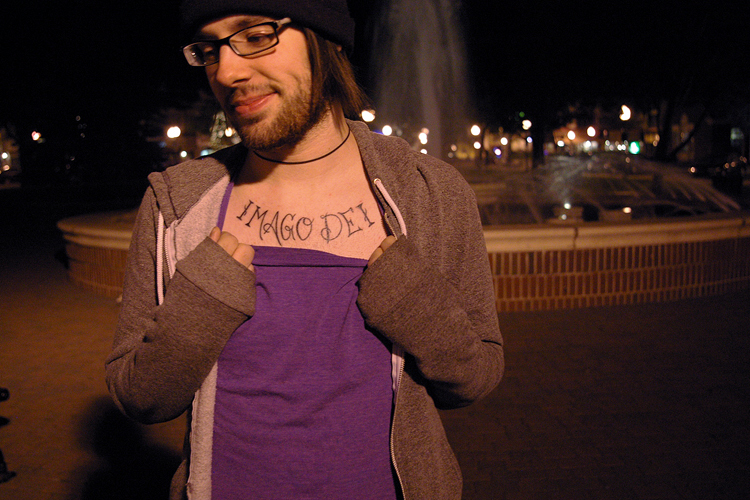 In stating this he builds upon John XXIII emphasis of the Catholic concepts of subsidiarity, solidarity, human dignity, and utter respect for God’s creation – where the man made in the image of God – imago Dei – always takes precedence over ideologies and systems. Subsidiarity is enjoying a recent resurgence in popularity in European democracies, especially in the UK, where the government has incorporated something that seems very much like subsidiarity in to its flagship policy, but has named it localism. Subsidiarity as we all understand it was developed by Oswald von Nell-Breuning, a German Jesuit theologian, whose thinking was pivotal in the publication of Quadragesimo Anno (1931) by Pope Pius XI, and whose writing was banned by the Nazis. Subsidiarity affirms that however complex a task may be, or however far reaching, it should be undertaken at the most local level possible. John XXIII was always at great pains to reject the Crushing of the Human Spirit and to oppose authoritarianism and narrow minded xenophobia. To be Catholic is to be global. The word means “according to the whole”, and in every generation the Church’s adherents have sacrificed their lives to live out the Great Commission from Jesus to go out to all the nations of the world and to baptise all people in the name of the Father, Son and Holy Spirit (Matthew: 28, 16-20). Worldwide there are two billion Christians; 1.2 billion Catholics. The onus is universal – it applies to all those who accept Him – and it expected to be lived out universally: “all nations”. In his encyclical John XXIII, like Pope Francis, whose origins and characteristics are very similar, was appealing for peace and for harmonious co-existence. His successor, in the Council’s most contentious Declaration, Dignitatis Humanae, set out the terms on which religious believers and non believers could co-exist and enrich one another. It explains our obligation to share though never to impose. Who could say that this is not a message which the world needs to hear in our own times? Just before Easter I stood in the charred remains of an Islamic madrassa which had been burnt out in an attack by Buddhist extremists in Burma. The mosque had been desecrated and all but a handful of the 200 Muslims living in that village had fled – from a village where they had co-existed peacefully for 200 years.The same scene could be replicated in situation all over the world where believers turn on believers ,non believers on non believers, believers on non-believers and non-believers on believers. It leads to terrible suffering and painand done in the name of God or god or man made ideologies of non belief. 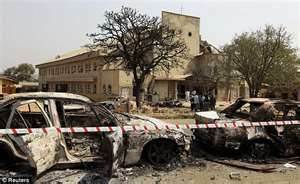 Last year in the top 16 countries responsible for the most egregious and systematic violations of religious freedom, listed by the U.S. Commission on International Religious Freedom, persecution of Christians occurs in every one of those nations. This signals how malign and hostile the global environment may be and also, despite our “interconnectedness”, how indifferent we frequently are to those who reside with us in the household of faith. 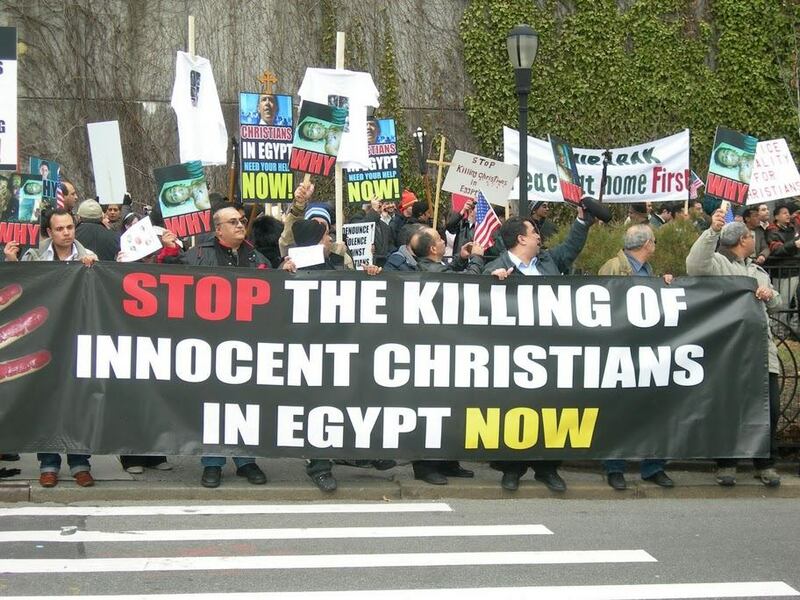 • Christians slaughtered – the world yawns. 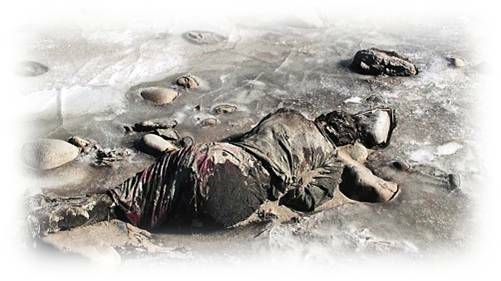 • Ober 100 Buddhist monks burn them selves to death in self immolations. It is against this backdrop that we should return to Dignitatis Humanae (Declaration on Religious Freedom, on the right of the person and of communities to social and civil freedom in matters religious), promulgated by Paul VI, December, 1965. The Council fathers set out the terms on which Christians may remain true to the central belief and calling of universality – eschewing violent proselytism and theocracy and insisting on respect and tolerance while firmly asserting the right of Christians to worship freely and to proclaim their beliefs. It’s a message which the world desperately needs to hear in time such as these. The Second Vatican Council speaks audibly to a generation which even in a country like our own is witnessing heavy handed intolerance involving attempts to ban the saying of prayers on public occasions to the banning of the wearing of a cross; let alone the imprisonment and “re-education” of Chinese Catholic bishops, like Shanghai’s Bishop Ma, and the execution of converts to Christianity in Iran. We think of the horrors of North Korea, of Nigeria, of Egypt, of Pakistan, of Syria, of Sudan and Iraq – and many other places. Wherever it occurs, this is the crushing of the human spirit. It also diminishes those who do it and robs society of something which can be virtuous and inspirational. Strengthening religious freedom consolidates social bonds, nourishes the hope of a better world, and creates favourable conditions for peace and harmonious development, while at the same time establishing solid foundations for securing the rights of future generations. At the heart of all our concerns must remain the inalienable and inviolate dignity of the human person – which was a central theme of the document, Huamane Dignitatis and the encyclical Pacem In Terris – and which today we have experienced something close to aphasia. Born poor, but of honoured and humble people, I am particularly proud to die poor. See everything, overlook a great deal, and correct a little. The question for us is whether we take its message into our own times.